Usually, if I know I'll have some downtime during my travels, I'll pack an essentials tote with a few stamp sets, a bundle of inks, and some pre-cut cards, so I can spend some time crafting on-the-go. Here are a few on-the-go cards I created recently. 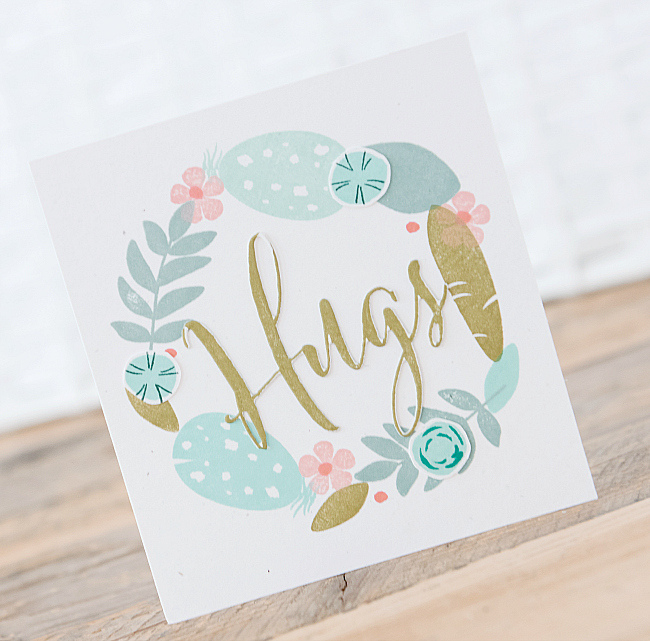 For the first card in the set, I used Concord and 9th Flourish stamp, Papertrey Ink Big Hugs die, and Pale Peony, Stormy Sea and Pinefeather inks from Papertrey. 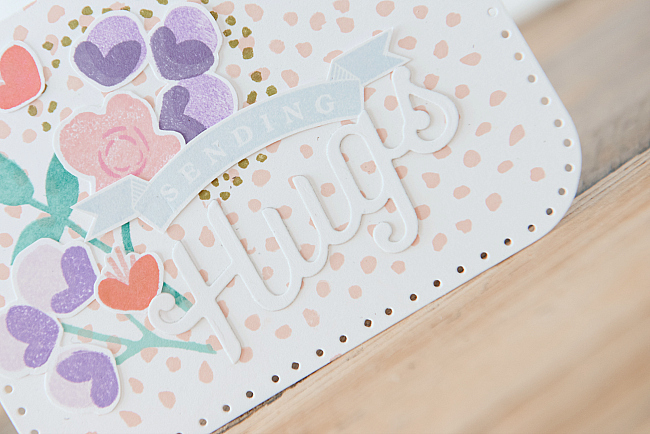 I stamped the hugs die with various floral stamps to create the pattern. Really loving this adorable set from Concord. It's so modern and also really classic, at the same time. It's also super versatile - allowing for plenty of mixing and matching - as you'll see on the cards below. 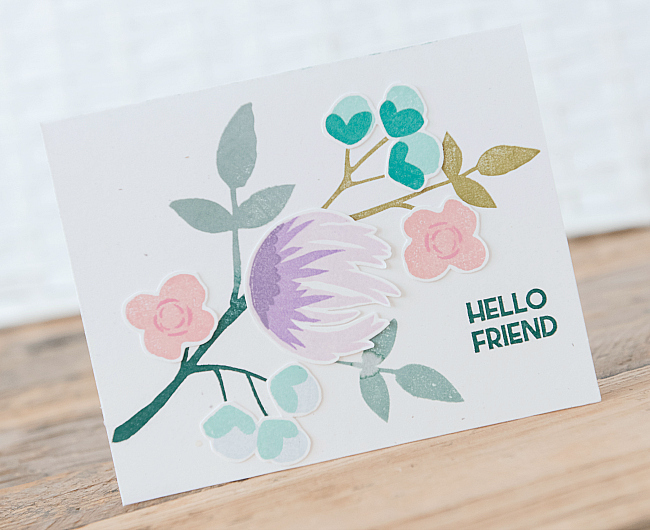 For this next card, I used some of the smaller flowers in the set paired with other sets for a totally different look. 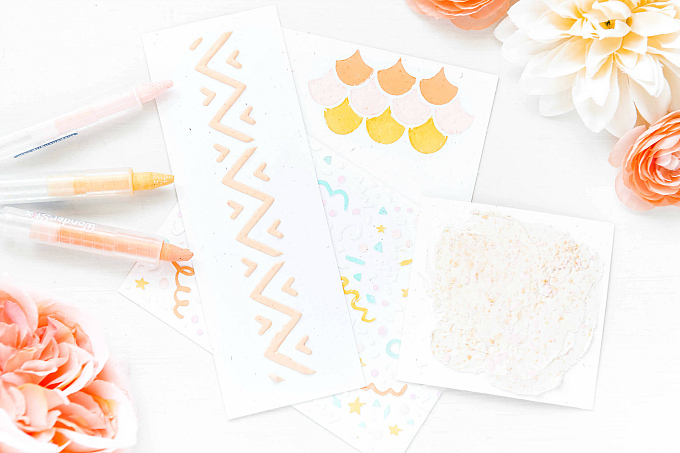 I'm finding the more I use the Concord and 9th Flourish stamp, the more I find that it's really perfect for layering florals in any design. 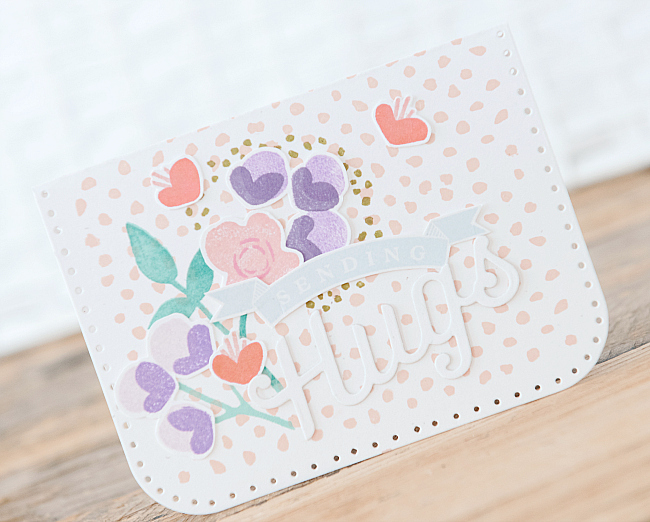 For the background, I used Prima Offset Dots, which I love! It's a modern take on a polka dot design. Can't go wrong with that. 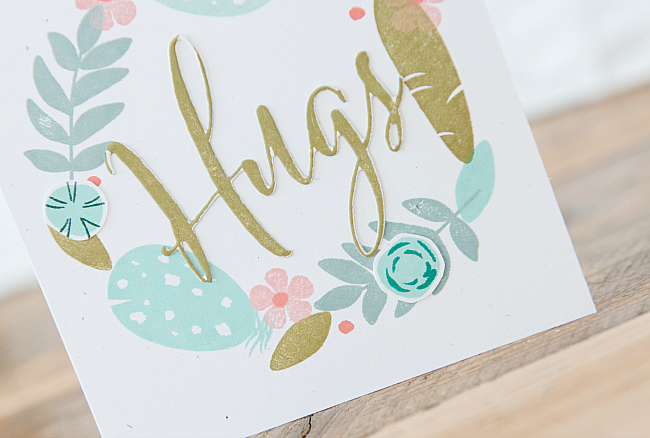 Once again using the hugs die from Papertrey Ink as well as the stamped sentiment from PTI's Big Hugs stamp set. For this card, I switched things up and used a different set, WPlus9 Feathers and Florals. Another total fave! It's so fun to create these pretty wreaths, which were inspired by the talented Yana Smakula. Seriously, if you don't have this set, go get one! It's sooo lovely. 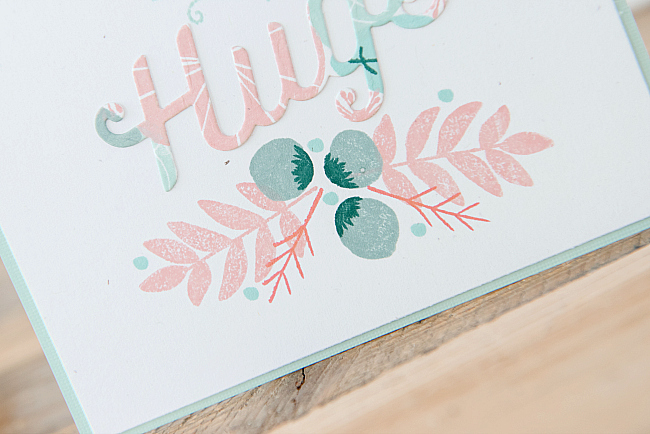 This card was stamped using Ripe Avocado, Aqua Mist, Ocean Tides, Pale Peony, Berry Sorbet inks from PTI. 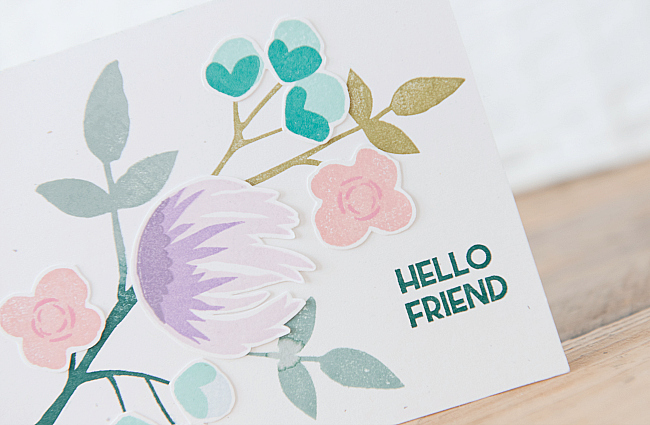 Lastly, a full floral feature of the Concord and 9th Flourish stamp. 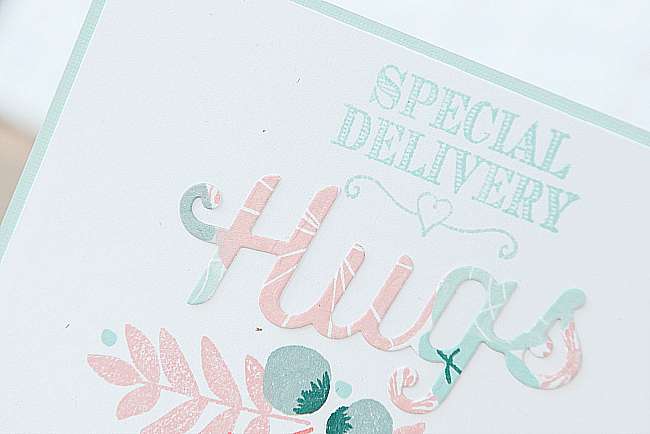 Isn't the floral design of this stamp so pretty? It reminds me of the beautiful vintage cards my grandma used to have tucked away in her cupboard. I tried to mimic some of the same colors I remember from those beautiful cards. For the ink, I used Lilac Grace, Amethyst Allure, Plum Pudding, Ripe Avocado, Hawaiian Shores, Aqua Mist, Spring Rain, Tropical Teal and Stormy Sea, Pale Peony, and Berry Sorbet inks from Papertrey. These cards are much cleaner than the style I usually go for, but crafting on-the-go makes me step out of my comfort zone, which is a great thing. Plus it keeps me occupied while we're away. I'm actually working on a set while enjoying a rainy day in Niagara Falls as we speak. I'll be back to share them (and hopefully some snaps from our trip) very soon. I always enjoy your soft delicate colors! These are all so pretty! 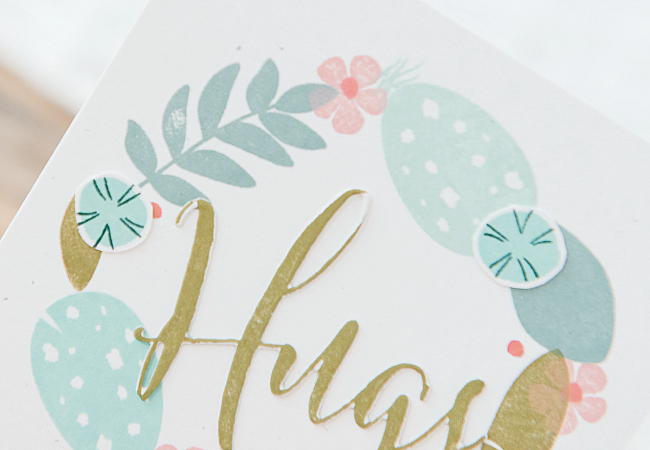 These cards are dreamy Ivana! Very pretty. I really enjoy the HUGS sentiment used in several different ways. A stunning collection! I’ve been browsing your blog and am in love with your work. I feel like I found a treasure! Aww, thank you so much, Lindsey! I just can't tell you how much I appreciate your sweet and kind note :) I am so glad you're here and that you reached out! Sending big crafty hugs!